If you have plenty of outdoor space and enjoy working with livestock, a llama can make a rewarding pet. Llamas are herd animals, though, so keeping a solitary llama isn't a good idea. A member of the camel family, llamas can keep other hooved pets company, such as donkeys, ponies, horses, goats and sheep. Male llamas, whether or not they're gelded, make good protectors for sheep herds. Native to the South American Andes Mountains, llamas weigh between 250 and 400 pounds, with males larger than females. That makes them on par weightwise with ponies, although they're much taller. A full-grown llama stands about 4 feet high at the shoulder, with his head between 5 and 6 feet tall. If you obtain a llama as a baby, or cria, you can expect him to be around for approximately 20 years. Long used as pack animals, llamas are suitable to training to pull a cart. A llama can serve as a therapy animal, visiting people in nursing homes or similar facilities. The first step in training is getting your llama used to a halter and lead shank. Once he's got that down, you can progress to taking him for walks and carrying weight. You can also teach a llama tricks. Take a page from dog obedience or agility training and see if you can teach him to stay, come or follow basic courses. If you can't provide your llama with a pasture to graze on, make sure he has plenty of hay. They don't require high-feed concentrates. You can give him apples, carrots and similar fruits and vegetables as treats, much as you would a horse or goat. Ask your vet about the best vaccination and worming schedule for your llama. These animals don't do well in heat, so before hot weather begins in your area, arrange to have your llama sheared. You must leave enough of his coat on, at least 2 inches, to prevent sunburn. He might need access to a stall with an outside fan when the weather is extremely hot and humid. As you've probably heard, llamas can spit. They do it among themselves in order to establish and keep a herd hierarchy but they can aim at and hit humans if they want. 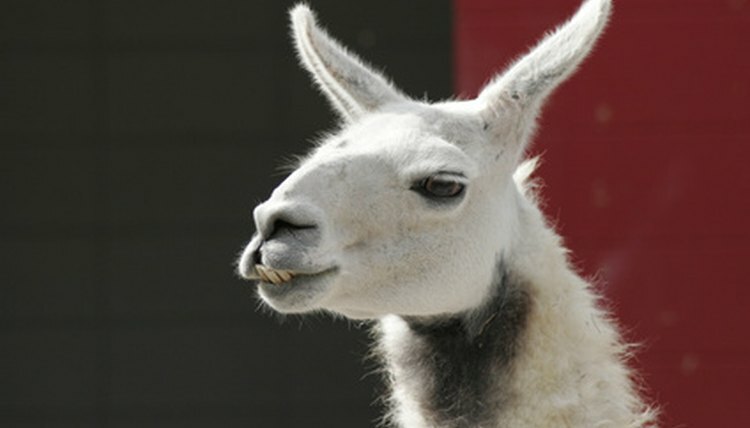 Generally, llamas spit at people when stressed or handled incorrectly. If you plan to train your llama as a therapy animal, spitting is something he must be gently persuaded not to do.